(Nanowerk News) Researchers have fine-tuned a technique for coating gold nanorods with silica shells, allowing engineers to create large quantities of the nanorods and giving them more control over the thickness of the shell. Gold nanorods are being investigated for use in a wide variety of biomedical applications, and this advance paves the way for more stable gold nanorods and for chemically functionalizing the surface of the shells. 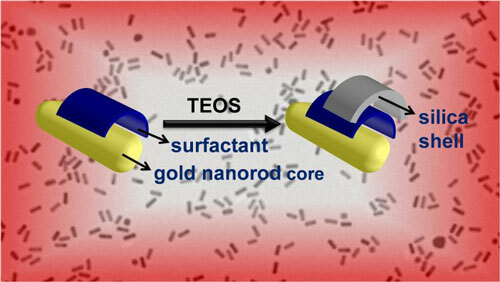 Gold nanorods have a lot of potential applications, because they have a surface plasmon resonance – meaning they can absorb and scatter light. And by controlling the dimensions of the nanorods, specifically their aspect ratio (or length divided by width), you can control the wavelength of light they absorb. “This characteristic makes gold nanorods attractive for use in catalysis, security materials and a range of biomedical applications, such as diagnostics, imaging, and cancer therapy,” says Joe Tracy, a materials science and engineering researcher at NC State who is senior author of a recent paper ("Large-Scale Silica Overcoating of Gold Nanorods with Tunable Shell Thicknesses") on the improved technique. Gold nanorods are efficient for photothermal heating, the process of converting absorbed light into heat. If too much light is shined on gold nanorods, however, they can lose their rod shape and change into spheres, losing their desirable optical properties. One way to help gold nanorods retain their shape during photothermal heating is to coat them with silica shells, which confine the nanorods to their original shape but allow light to pass through. For different applications, it is important to be able to control the shell thicknesses. With thin shells, the change in size of the nanorods is minimal, and the gold nanorods can still pack into dense assemblies. On the other hand, thicker shells can act as buffers, preventing nanorods from bunching closely together and shielding them from their environment. Silica shells also provide a surface that can be functionalized using well-understood chemical techniques. For example, the shells could be functionalized to fluoresce in the presence of specific proteins or to target tumors. “The silica shells offer multiple benefits – and our modified approach to coating gold nanorods with silica shells has two distinct advantages,” Tracy says. The modified technique has two steps.